Show SobiPro entries in JomSocial profiles! 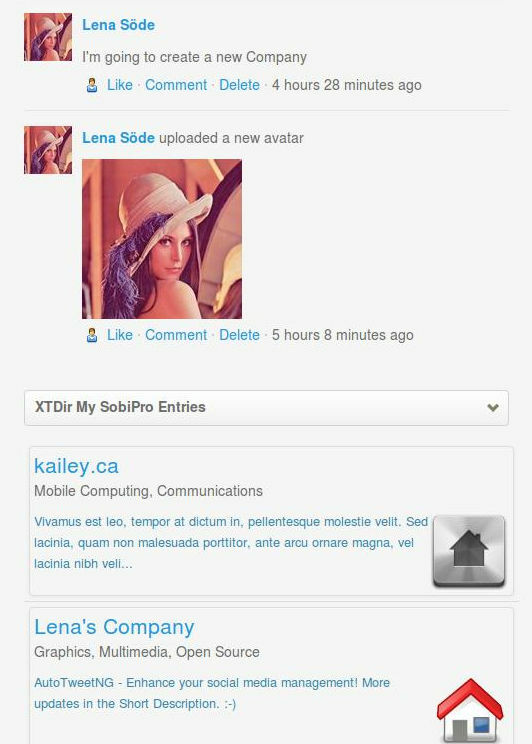 "XTDir My SobiPro Entries for JomSocial Free is plugin for JomSocial to provide a core application to show SobiPro entries." Extension formerly known as SobiProPosts. When an user publishes SobiPro entries, they are associated with the user. My SobiPro Entries shows these entries in the user profile. In these examples, you can check how XTDir extends JomSocial and SobiPro in our demo site http://demo.extly.com. Please, check it here in the demo site http://demo.extly.com, where you can find the classic JomSocial 3 installation and SobiPro v1.1 business directory, with 2.000 more entries to fill the catalog.